One of the most common questions I’m asked as a mama of multiple girls is “are you going to try for a boy"? Well meaning strangers see AJ with his daughters and jokingly suggest that he’s “going to have his hands full” when they’re teenagers, or that it’s a shame he’s so outnumbered. Although we’ve never been discontent with our girl gang, the idea of instilling self-confidence and individuality at a young age in my girls weighs heavy on my mind. Raising boys, which of course I have no experience with but know through chatting with friends, research, and watching my own brothers grow up into men, is naturally a different experience and being a mom of only girls is a mental adjustment I’m still working on. I’m keenly aware of just how closely my five and three year old watch me. Everyday when I get dressed, put on makeup, size up my ever changing body in the mirror, or make snide comments about my body that I don’t think they’ll understand, I’m aware (usually after the fact) of their little brown and blue eyes watching me and their growing minds processing how I see myself. Will they resent me when they’re older for getting eyelash extensions? Am I letting them try out my lipstick too early? Is their wardrobe too “girly”? Am I modeling a balanced perspective of femininity? Did they see me scrolling Instagram admiring the wardrobe/lifestyle/body type/life phase of someone else? How do I, a young mom still very much figuring this whole self-confidence thing out for myself, instill these vital traits in my daughters? This post is less of a “how to” guide (because in the realm of parenting, those don’t really exist) and more of a conversation around the subject of self-confidence and a few ways I’m working on modeling it in my day to day life in front of the girls. Of course, the same concepts can apply to raising boys too, and whether you’re raising boys or girls, I’d love to hear your tips and suggestions on the subject! All kids love “helping” their parents do adult-y things and, despite the fact that their efforts to help or join in usually aren’t all that helpful, I think it’s vital for kids to try their hand at the things mom and dad are doing AND feel reinforced in their efforts. For us, it’s usually letting the girls “get ready” with me in the morning, even if they smear lipstick all over their faces or pick out mismatching outfits. It’s letting them stir the cookie batter, even though you know it will be messier and take longer. It’s letting them help clean up and giving them the time to scoop snow with daddy, even if the snow all ends up back in the pathway. These simple (slightly inconvenient) gestures instill confidence in my girls through simply giving them a safe space to experiment, help, and learn new things. I’ve made this mistake SO MANY TIMES and I’m sure I’ll make it a lot more, but I think especially with girls, it’s so important to let them take the lead when it comes to what they love to wear, how they like their hair done, and even what kind of toys they play with. A few months ago, I was helping Evie get ready for preschool and she walked in with an entirely pink outfit on; from head to toe, bright pink. I mentioned something about that outfit being really “girly” and asked if maybe she wanted to change her pants or something, and for a few weeks afterward she was obsessed with making sure her outfits were “girly enough” and didn’t become “too girly”. Regardless of my personal taste (which tends to be super neutral, especially for kids), I’m working on letting them pick clothes/toys/hair styles just because they love them, and not necessarily because it fits a certain aesthetic or stereotype. 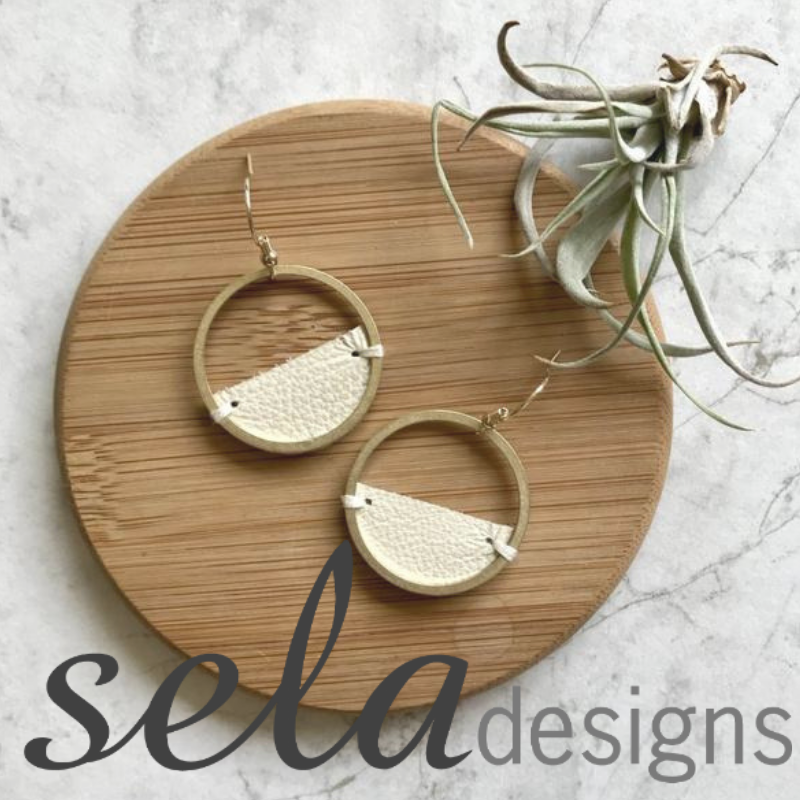 My girls love beautiful things, as most girls do, and little surprises like their You & Me Tassel Necklaces from Sela Designs are the perfect little accents to start conversations around inner beauty and highlighting it with beautifully made things that they truly love. For the first few years of my motherhood journey I rarely made myself a priority. Of course, it’s not easy when you’re raising babies or toddlers or multiples, but as my girls have gotten older and as I’ve done the same, I’ve learned that in order for me to raise them well and lead by example I’ve got to give myself time to recharge. As they grow up though, I hope they’ll be able to look back and see that self-care is an act of courage sometimes, and that I modeled it well most of the time. Girls grow up with conversations centered on their appearance from such a young age. And, of course, there’s nothing wrong with telling a girl she’s beautiful (that’s important too! ), I’m working on mentally rewriting my own script for when it comes to talking to my girls and complimenting them. I’ll try to focus equally on their character, their choices, or their talents, instead of their appearance only. Pieces like my Round + Square silk scarves or t-shirts (which my girls have been known to steal from time to time) have empowering phrases on them that help spark conversation. Instead of saying how “pretty” their hair looks, I can talk about what being “brave and kind” means or what “#equality” looks like early on, or why “Girl Power” isn’t just a catch phrase. I’m still very much a work in progress as a mother, especially as I think about my girls getting older and requiring more and more intentional modeling and behavior. My job is on the internet, requires me to take photos of myself all the time, get new things, and seems very externally focused on the surface, so I have ample room for improvement and conversation around self-confidence and inner beauty. How are you having these hard conversations with your kiddos? I’d love to hear your experiences.